The only calendar designed for team use is all about making your job easier. Some issues with popular calendar services come up again and again; here’s how Teamup can get you past these frustrations. In most calendar services, the calendar can quickly get messy as the number of people who need to access it grows. That’s because most calendars weren’t designed for group collaboration, but for individual use. While they’ve been modified and expanded to allow team use, the functionality isn’t smooth and easy. “We are using Microsoft Outlook to operate all 38 calendars, and are pushing it to its limits. 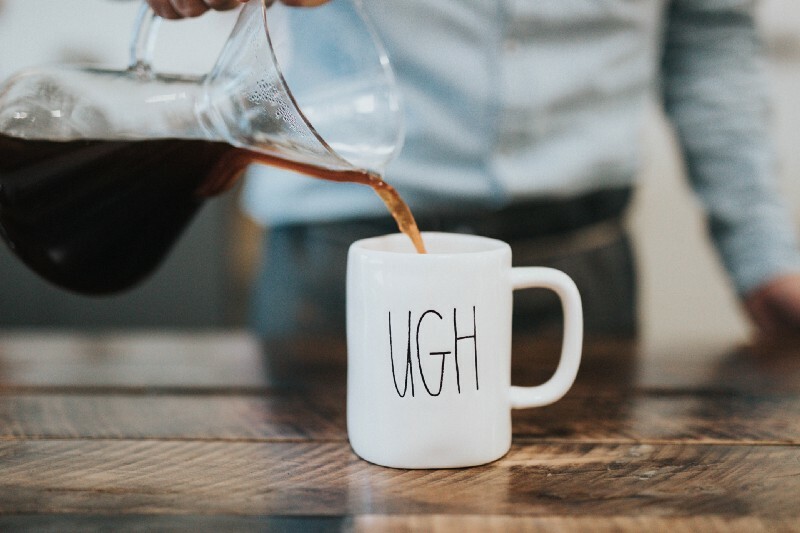 We have run into multiple tech problems that are affecting sales because Outlook can’t hold our capacity anymore.” — Charisse E.
The alternative, then, is to create separate calendars for various individuals and groups. Individual calendars can work, but can also cause issues. Every user makes decisions about what they add to and share from their individual calendars, which may not represent the best interest of the company or organization. With Teamup, calendar control is centrally managed, which provides maximum organizational efficiency. With Teamup’s sub-calendars and customized calendar links, individuals or groups can still have the access and functionality of a separate calendar. But the central settings for the calendar — and all the sub-calendars owned by it — are managed by the calendar administrator(s), rather than by individual preferences. If you need to delete or modify an event added to a group or individual sub-calendar, you can do so without requesting access from the group or individual. If you need to revoke access to the calendar (all or selected sub-calendars) by a user or user group, you can do so. This is especially useful, for example, when an employee leaves your company. If you need to share an event or calendar temporarily, you can create a customized calendar link, share it, then turn it off or delete it after a set period of time. If you need to add tasks or appointments to an individual or group sub-calendar, you can do so directly without going through a lengthy email conversation or requesting calendar access. Many users have expressed frustration over how difficult it is to get a big-picture view — to see everything that’s going on, from multiple calendars. Outlook, for example, has an “overlay” mode which allows users to see multiple calendars on the same screen; but it requires multiple steps to set up, and still doesn’t always meet user needs. The side-by-side view is default, and users are relegated to clicking between tabs or panes to compare events from different calendars. Teamup’s multi-calendar view is easy to use and built in to its design. With a single click, you can “hide” a calendar from view, or click again to turn it back on. When you organize with folders, you can turn an entire set of sub-calendars on and off from view with a single click. Sub-calendars organized by folders are easy to manage in your calendar view. With most calendar services, sharing a single calendar event is not a big problem. But sharing multiple events, or an entire calendar, is a big hassle; you risk data security by allowing users outside of the organization or system to access the calendar. Sharing multiple events individually, however, clutters everyone’s inbox and becomes time-consuming. Cross-organizational sharing, in short, is a security issue. And cross-system sharing can quickly become a logistical nightmare. Teamup solves the sharing problem with unique, customized calendar links. No user accounts are needed. The calendar administrator can create custom links, allowing limited access to the specific sub-calendars they choose. And each link has designated permissions set for each sub-calendar included, which eliminates security issues. Set a permission for each sub-calendar you share to limit information and access. 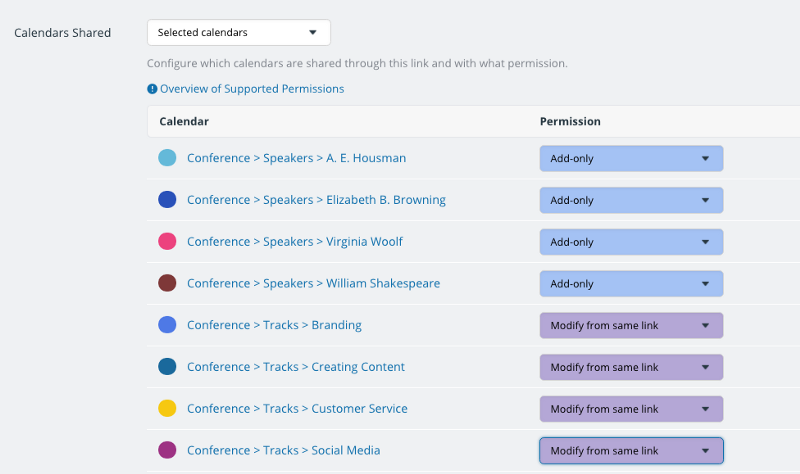 Permission access levels range from read-only, no details (which shows events only as reserved) to modify (which allows full ability to add, delete, and edit events on the calendar without access to the calendar settings). With a single link, you can grant limited, controlled access to an entire calendar with anyone, from any organization, using any system. They can see what you choose to share on the calendar. And you can revoke access to the calendar at any time, by deactivating or deleting the shared calendar link. Teamup also includes multiple sharing options for individual events; since the standard iCal format is used, it’s still easy to send an event invitation to someone else’s calendar. Or you can share an event as a webpage or via social media, easily. An event shared as a webpage is an easy, sleek way to share an event. Both the calendar links and the sharing options make it easy to get everyone involved — as involved as they need to be — without security risks or frustrating login issues. Interested in what Teamup could do for you? Try out one of our live demo calendars, or read through our user stories for more inspiration. Header image by Nathan Dumlao on Unsplash.